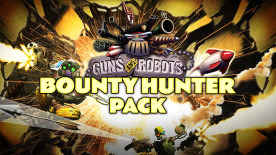 Bundle up with this Guns and Robots' Bounty Hunter Pack to become a notoriously successful bounty hunter. Get this Guns and Robots pack filled with Sparks, Upgrade components and a chance to get exclusive items from the Reinforced Crates . 5 Reinforced Crates with 2x Crowbars: Each crate can drop one of the following: Upgrade components, Device charges, Boosts or an opportunity to get your hands on an extremely rare part.